It is strange to be writing this post right after the biggest outage in the cloud computing history. Outage or not, I feel the march to the cloud is all but unstoppable. Not only is this outage not going to deter more people to come to the cloud, it will, in my humble opinion, accelerate cloud computing momentum. Even though the outage was confined to a single region of the Amazon EC2 cloud, it was, and still is, at the top of the news and the world at large can finally understand just how much workload has already moved to the cloud. This brings me to the cloud and Siebel. When I was about 13 years or so younger I worked on helping Siebel take advantage of the IBM DB2 databases. Working with Siebel was really exciting. It was the company founded Tom Siebel, a former Oracle executive, who flipped Larry Ellison a bird and built the most successful customer relationship software company just a few miles up the highway 101 from Oracle headquarters. Siebel was on top of its game. By 2002 they owned the CRM market with 45% share. For CIOs, Siebel, was the package to get and for IT pros, Siebel was the top skill to acquire. Imagine my surprise when I come across an article from 2009 that declares Siebel to be one of the top 10 dying IT skills. Actually, there was no surprise at all. I have not come across a new large scale Siebel project in years. Sure there are companies that are growing their Siebel footprint. Every company I deal with uses some sort of cloud CRM solution with Salesforce.com being an undisputed leader. There is no shortage of challengers including Oracle CRM on Demand, Oracle’s so far not very successful attempt to regain control in this space. SAP recently launched their CRM solution on the IBM Cloud (running on DB2 naturally) and is starting to attract marquee customers. Open source solutions such as SugarCRM and others also have transformed themselves in to SaaS offerings as well. When it comes to the SaaS, CRM seems to be the sweet spot. What does it mean to IT people? 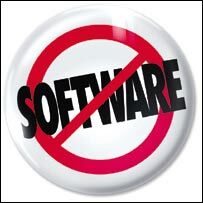 I think Salesforce.com’s famous “no software” logo explains it the best. When consuming software as a service, you no longer need to purchase, install, configure and maintain the hardware. You don’t have to plan for, install and continuously update the software either. You no longer need Siebel skill. The IT people end up working on something that Salesforce.com and other SaaS providers don’t deliver. We are getting a lot of interest integration and analytics. Customers with extensive Salesforce.com deployments are in dire need of integration with their on-premises data and systems. This market is exploding. One of the attributes of the CRM is that is is a great source of customer interaction data which is an invaluable resource for growing the top line revenue. When this data sits in a cloud CRM it is just data, not actionable insight. There literally a whole new industry being created with an express purpose of deep analysis of this data. You may have heard of “Big Data“. Big Data’s most prevalent use cases are anchored in understanding customer sentiment and analyzing customer interactions. Siebel is dead or at least walking wounded. It was killed by the cloud. If you enjoy racking and cabling servers and patching operating systems or installing Siebel and doing endless version migration projects then I have some bad news for you. This type of work is going away. However, if you are interested is some challenging work integrating data and analyzing vast volumes of information, you are in for an exiting ride and a really good compensation to boot.